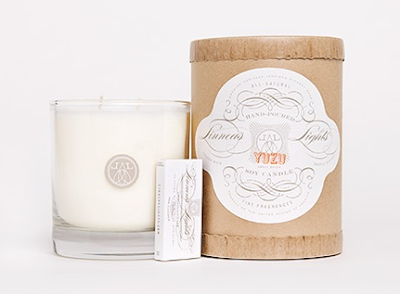 Do yourself a favor and go to The Inglenook Decor and order the Yuzu candle by Linnea Lights. Let me tell you, it is the most AMAZING smelling candle I have ever bought- seriously it is like a little slice of heaven in my family room when I have it lit. The scent is described as "Luscious Japanese grapefruit, exotic fruits & watery greens", but it is so much more, its perfect. I got the candle this weekend and have had it lit since the second I opened the package, I think I'm going to have to buy stock in them because I will not be able to ever buy another candle. Even the BF (who is usually a pretty tough critic) thinks this is the best thing I have ever bought, he LOVES it! Even better news is The Inglenook Decor is offering free shipping with the code LIGHT for a limited time. Go here and order your slice of heaven today- you will not be disappointed! Oh I do love candles, I am sold! mmm. Does sound heavenly! I'm extremely picky when it comes to home scents but this sounds like a winner. I've been stuck on Diptyque's Baies (the white in the BRs and the black in the LR) for awhile. I may have to give this one a try...I trust you! Ever try Votivo's Red Currant?? yum. i love a great smelling candle! im currently obsessed with the voluspa champagne one! Good to know, thanks for the review. My candles are all burned down to their bases. Oh, I have some yuzu scented body wash, and I love it! I'll have to check this out! Oh no, I can't bring another candle into my house...but this is very tempting! I love suggestions on candle scents...and this one sounds like a winner! I have been dying for a great candle! I need some for my room! This one looks so clean and pretty.